Jen Mirabile: I love Fall! I absolutely love the Fall! I love opening all the windows and letting the breeze run through the house, the crisp fresh air. Pulling out all my cute sweaters and boots. Being able to order Pumpkin Spice Latte's from Starbucks! Knowing the holiday season is almost here. And getting to watch the leaves change colors!! This will be my first year to see the beautiful colors everywhere being that I am from Florida and you just don't really see that. It is my favorite season and then comes winter which I am pretty excited to be spending our first here in Tennessee. Hopefully we'll get to see snow here. If not we won't have to drive too far to see it. Anyways, back to the fall. 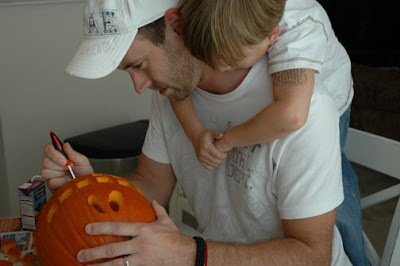 This weekend we spent some time carving the pumpkin that Andon brought home from school. Jared wanted to do something simple. Last year they went all out but I thought the pumpkin was kind of scary so we did cute this year. 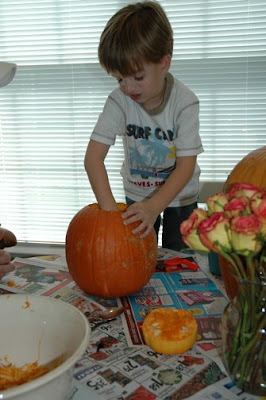 :) Here are some pictures of my boys hard at work on the pumpkin. First cleaning the thing out. 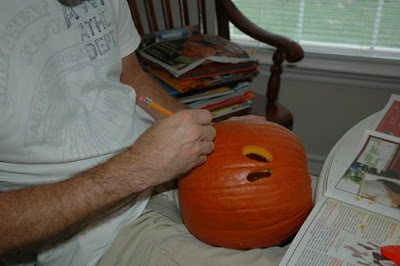 And carving the face out. 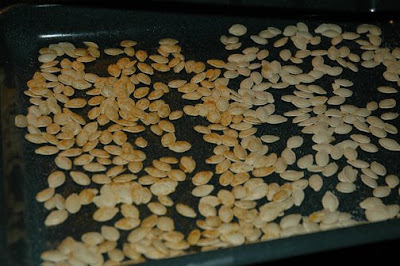 So after they cleaned out the inside of the pumpkin I started rinsing the seeds. 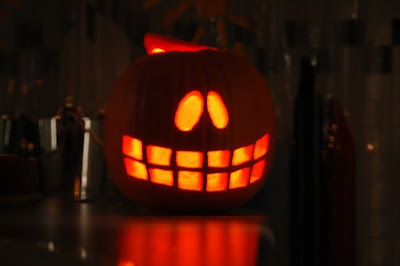 I have never made pumpkin seeds but knew it was pretty simple. 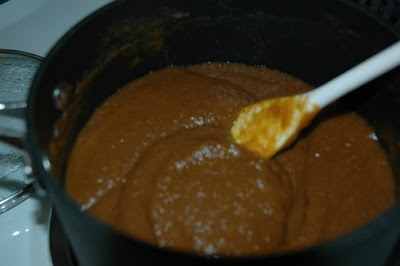 Here is a picture of the finished product. They were so yummy!! I love getting into the changing seasons. Next weekend we will be going to a pumpkin patch and corn maze. I will take lots of pictures and start getting some pictures of the beautiful colors all over the mountains! I haven't talked to you in a while or commented on any of your postings in a while either...sorry! I've called a few times, when I've had an extra second, but no answer. I love reading your blog and seeing what you guys are up to. I am glad Andon likes school!!! Can't wait to see the fall pictures! If you can call me between7:00 and 7:30am, that's when I am on my way to work and have a little time to talk. It sure doesn't feel like Fall down here. I am ready for some cooler days. I love the changing seasons too. You are going to LOVE Fall up there! I second this blog! Fall is really the BEST and to enjoy the leaves changing and the cool air has got to be the best. We are headed with the kids right now to get our pumpkin. Miss you lots! Dan and I are so excited about heading to North Ga on the 26th. I keep checking the internet to get updates on the fall foliage where we will be. Right now they say patchy, so I'm thinking it will be around peak when we are there. I love that you did the pumpkin seeds and butter! There is something about the slight chill in the air, getting out your sweaters, boots, opening up your windows and being able to smell the autumn air! Take lots of pictures of the leaves for me! BTW-thanks for sharing about your sister at the retreat, I pray she is getting stronger and will turn towards GOD thru all that has happened! Keep me posted on how I can pray for her! I enjoyed seeing you at the retreat and hope you can make a trip to visit us again! OH how fun!! Yep, pretty much it is still hot here. I get really excited over the slightest breeze. :-) I'm so glad you have all of those fun things to enjoy. You have given me reason to at least start pretending it is fall here. I love FALL too! I wish we could enjoy fall in Orlando as much as Tennessee gets too! Great pictures! And oh...those Pumpkin Spice Lattes!!!! How fun! I love it. . .We need to do this too. . .I just LOVE fall, not that we get the weather like you do now or anything!